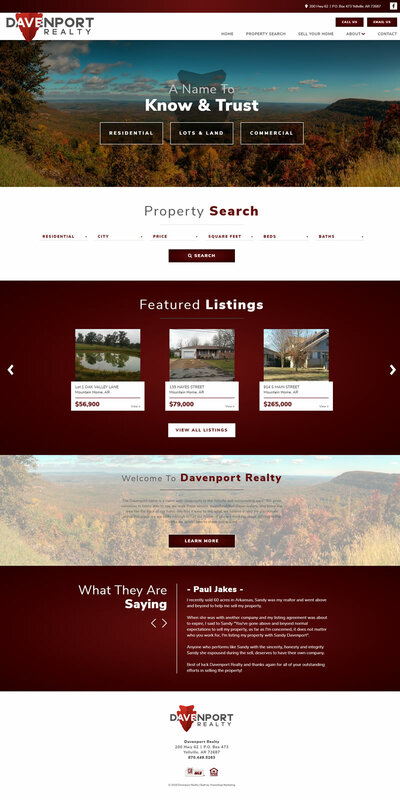 Davenport Realty needed a modern website to showcase their new business. VisionAmp collaborated with the new business to create a mobile-friendly and responsive website that catered to the needs of those searching for a house or land in the Twin Lakes area. The new site displays large images at the top with clear call-to-action buttons front and center. We also worked to make sure that phone and email options were showcased at the top of each page so that people could contact the business without having to search through the site. The navigation menu is simple and makes searching for a home an easy process. Davenport Realty is a new real estate company in Yellville, Arkansas. While the business is new, the realtors have years of successful experience under their belt and have called the Ozarks “home” for many years.